Real Name: Unrevealed. "Captain Tyger" was a nickname. Nature of abilities: Inherited from his mother, reinforced by constant training and practice. 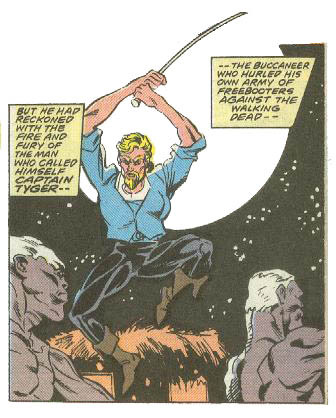 Powers/Abilities: Captain Tyger was a prodigious swordsman and had inherited superhuman physical abilities, including cat-like eyes, enhanced strength, speed, agility, reflexes, and senses. History: (Dr. Strange III#17/2) - Captain Tyger's origins are unknown. We know that his father was an unidentified French nobleman and his mother was one of the legendary Cat People. During the mid-17th century, Tyger rose to become the "deadliest" of the notorious French freebooters known as Frères de la côte (Brothers of the Coast) who preyed on Spanish galleons from their base on Tortuga Island. Captain Tyger viscerally hated slavery (perhaps because he himself had once been a slave?) and freed his engagés (a French word for slaves at the time), including the twin native brothers, Laurent and Alexandre. Perhaps because of this, and other unrevealed reasons, Tyger developed a fierce enmity for the freebooter Boute-Feu, who trafficked in slaves, raiding his ships and freeing his human cargo. To gain revenge Boute-Feu ambushed and killed Alexandre. He then dragged the body to the vodu priest Schango who, with the help of the vodu god Sagbata (who himself called upon the elder god Chthon), turned Alexandre into the first of the vodu zombies. (Dr. 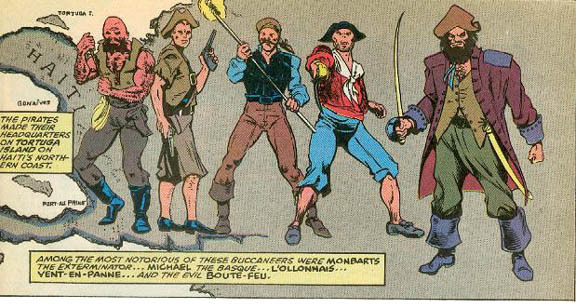 Strange III#20) - Boute-Feu used the zombies raised by Schango to attack Port-Margot, and fought against Tyger. Meanwhile, the vodu gods, appalled by Sagbata's actions sent one of their own, Legba, to help mankind. Legba took Laurent and entrusted him with power over the Loa, the vodu spirits. Laurent then confronted Schango and, using a spell given to him by Legba (perhaps created by Gaea), summoned Alexandre's spirit to merge with him. He then killed Schango. In Port-Margot, Boute-Feu's zombies crumbled into dust and the evil freebooter was killed by Tyger. Comments: Created by Jean-Marc Lofficier, Roy Thomas (writers) and Geof Isherwood (penciller) and Mickey Ritter (inker#17 only). Captain Tyger was inspired by an 1869 French swashbuckling novel, Ourson Tête-de-Fer [Bearcub Ironhead] by Gustave Aimard. Boute-Feu and Doña Elmina are taken from the novel. 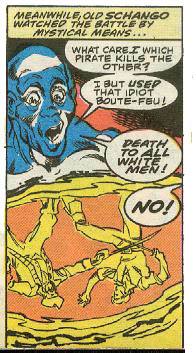 The idea of a line of Brother Voodoos throughout history (deliberately patterned after The Phantom's) was Lofficier's, but when Thomas had commissioned the original Brother Voodoo story, he always had in mind that there'd been previous Brother Voodoos. As confirmed by JML, the date listed as 16th Century in the Book of the Vishanti in Dr. Strange is wrong. It was during the 1600s, which makes it 17th Century. "Profile by" Jean-Marc Lofficier (yes, that Jean-Marc Lofficier!--Snood). Twin brothers, native of Haiti, who had been previously engagés (slaves) and were freed by Captain Tyger and became his devoted right-hand men. Alexandre was murdered by Boute-Feu and turned into the first vodu zombie. 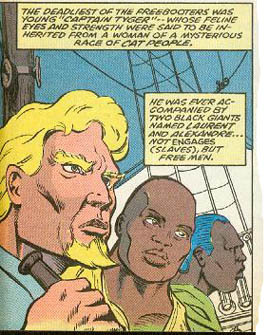 Laurent was entrusted power over the Loa (vodu spirits) by the god Legba, and later used a spell possibly crafted by Gaea to cause the spirit of Alexandre to merge with him, becoming the first Brother Voodoo. Vodu priest about whom it was said in the mid-17th century that he had been born in Africa, which would have made him about 180 years old (since he would have had to have been born before 1492). When the freebooter Boute-Feu asked him to create an invincible army, Schango saw an opportunity to kill the white men he hated and invoked the vodu god Sagbata who created the first zombie. 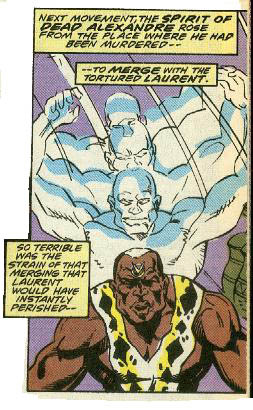 Schango was later killed in battle with Laurent, the first Brother Voodoo. Loose confederation of French pirates and freebooters who preyed on Spanish galleons and ports from their base in Tortuga Island on the Northern Coast of Haiti during the 17th century, mostly 1650-1670. - Boute-Feu is a fictional character introduced in an 1869 French swasbuckling novel, Ourson Tête-de-Fer [Bearcub Ironhead] by Gustave Aimard. - Captain Tyger is a fictional Marvel character.